As real estate professionals, it’s our responsibility to provide wise counsel about housing needs in the best way possible with our clients, including clients who are senior citizens. It’s been said that senior citizens represent the real estate industry’s greatest, untapped and under-served market. And, a growing market means opportunity. Serving most senior clients is likely to become a niche for a growing number of agents. I believe agents have an obligation to understand and learn about the housing needs of seniors so that we can do right with this fast-growing and often vulnerable group. We need to be better listeners to their needs, wants, frustrations and fears. We need to understand the empathy and support needed from day one to establish trust. It should come as no surprise to you that America’s population is aging at a rapid pace. People are living longer than ever before. None of us are getting any younger. By 2030 (about 10 years from now), 1 of every 5 Americans will be retirement age, according to the U.S. Census Bureau’s 2017 National Population Projections. By 2035 (about 15 years from now), seniors will outnumber children for the first time in U.S. history; it’s estimated there will be 78 million people 65 years and older, compared to 76 million people under the age of 18. The current median age of Americans is about 38 years old, up from 30 years in 1980 and 24 in 1970. -- Make up 16 percent of recent buyers. -- Higher median household incomes. -- More likely to have children under the age of 18 in their home. -- More likely to buy multi-generational homes. -- Buy for an array of reasons, such as job-relocation, downsizing, and being closer to friends and family. -- Make up 14 percent of recent buyers. -- Often moving due to retirement, downsizing, and being closer to friends and family. -- Typically move the longest distance. -- Least likely to make compromises on their home purchase. -- Make up 8 percent of recent buyers. -- Least likely to purchase a detached single-family home. -- 24 percent purchased in senior-related housing. -- Tend to purchase the newest homes. -- More likely than any other age group to find their home by visiting an open house. So, when dealing with the housing needs of clients who are senior citizens, our goal should be to add value based on our experience, trustworthiness and knowledge as we work through various challenges. To that end, keep in mind that senior citizens represent a large and diverse group of people. There is no one-size-fits-all solution for housing. Some seniors in their 70s and 80s prefer living in walk-up apartments with stairs because they admit the exercise keeps them strong and healthy. Other seniors have no children or grandchildren to move closer to. Other seniors would do well in a densely population walk-able areas that would require no driving and easy delivery of household goods and meals. Most seniors don’t want to travel far to the grocery store, gym or their doctor. -- “Aging in place” refers to people who prefer their current residence and don’t want to move in their golden years. This option is perhaps the most comfortable option for seniors, but the downside is that many older homes are not equipped with built-in features for disabled people. A reverse mortgage could be an attractive way to pay for repairs and remodeling that could improve the home’s accessibility. -- “Co-living” refers to living arrangements with roommates or group homes. This option can reduce loneliness but can mean less privacy when everyone wants to use the kitchen at the same time. -- Living in retirement communities with rented condos or apartments for people over age 55 is another option. Common areas for group meals and social activities can give residents a built-in social network. -- Moving-in with relatives is another option. Advantages of multi-generational households include a build-in support system with loved ones who can care for the elderly. -- Accessory Dwelling Units (ADUs), also called granny flats, is another option. ADUs are second homes built on the same lot as an existing single-family house. Often, these smaller, secondary units are constructed by homeowners in backyards or above garages of single-family residences. They can be used for family members or rented out as a source of income for homeowners. PSAR has been a strong advocate for ADU’s this year. They are ideal for seniors and their children. -- While seniors should consult a tax adviser, they should ask about Propositions 60 and 90. Prop 60 gives homeowners 55 and older a way to move or downsize without greatly increasing their tax bills. There are restrictions in order to receive this benefit. Proposition 90 refers to property tax transfers from certain counties like San Diego to other select counties in California. Many seniors are not aware of this generous tax break. Clearly, the future is old. I recommend you consider attending a class to earn your Senior Real Estate Specialist (SRES) professional designation from the National Association of REALTORS®. The SRES program is designed to equip you for serving the senior market. 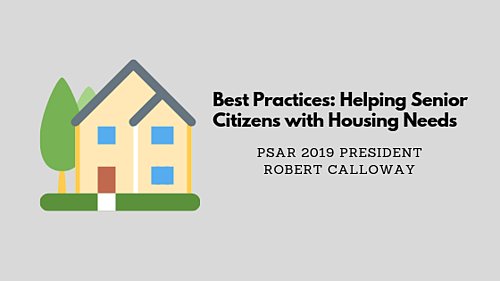 You will learn more about housing options and trends for older Americans, along with typical senior financial situations and how Medicare, Medicaid and Social Security can affect real estate decisions. PSAR is looking forward hosting classes for this designation later in the year.